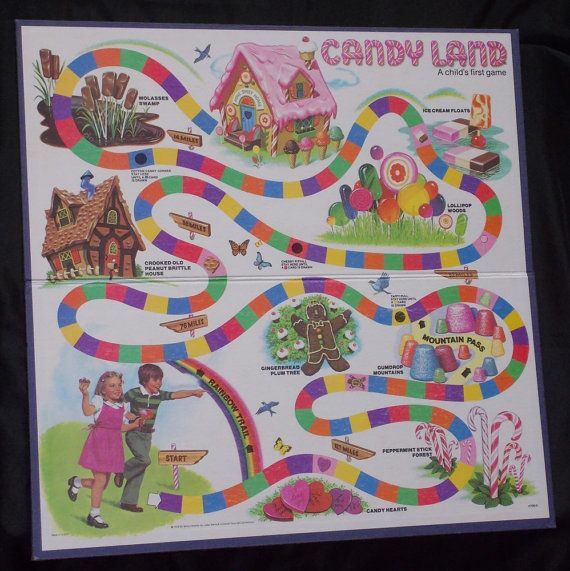 Candyland was more than a game for me: It was a mystical land. I imagined myself actually walking through it as I played the game, and I saw myself going into the houses. The newer games, which came out after I outgrew Candyland, had different pictures, too cartoon-like and not as fun and mystical as the old pictures the game had in the 70s. They walked along the spaces, sat on the ice cream floats (floating pieces of Neapolitan ice cream), and went into the various candy houses. The Peanut Brittle House–oh, what a weird, sinister feeling that place had! I dreamed about it once, that I was inside it with my sister. I had at least one sister and no brothers in this dream, just the opposite of my real life. She was working at the stove in an upstairs room by the window, making something in a saucepan. It boiled up with lava and began to spill out of the saucepan. We had to run away, because if it touched us, we would die. We tried to run out of the house, but it wasn’t easy. Ever since, I think of this dream whenever I see the old Peanut Brittle House. I don’t feel that way with the new picture of it, though, because it just is not the same at all.